After rushing to Iraq, Eaton and his staff reported to CPA headquarters and found they had inherited a 24-page PowerPoint briefing and a budget of $173 million.25 CPA’s original concept for the NIA called for three divisions of light or motorized infantry to be built by September 2006—in a little over 3 years. Those numbers were arrived at by a very simple logic. The Coalition had divided Iraq into three zones each of which would require a single division. The “rule of three” was extended downward, leading to divisional organizations that had three brigades, each of which had three battalions.26 Thus, the new army would have an overall strength of 27 battalions. To augment the NIA, the CPA directed CMATT to form a small aviation element and a coastal defense force.27 The NIA was designed to defend against external security threats, in contrast to its previous role as a prop for Saddam Hussein’s dictatorship. 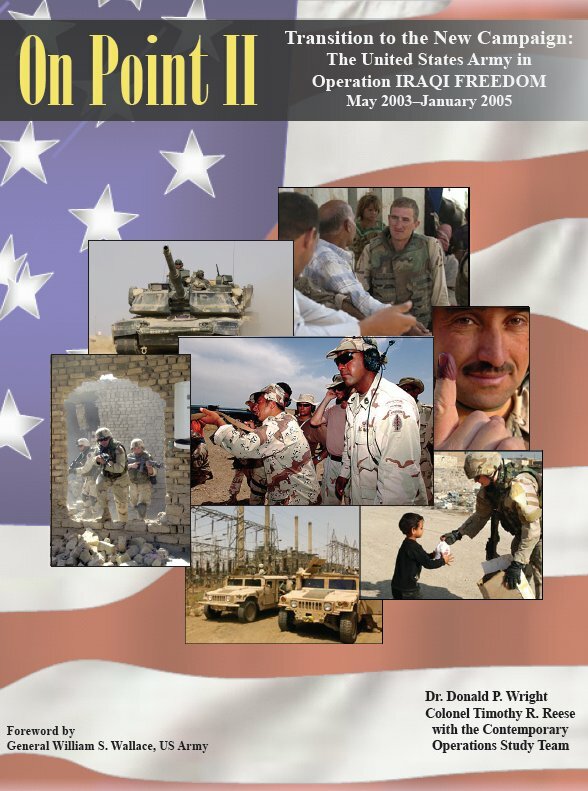 One key CMATT document emphasized the defensive nature of the NIA, describing the basic set of missions of the army as “point security, convoy security, route security, foot and vehicle patrols, border patrols and other duties for territorial defense and stability operations in Iraq.”28 The plan kept the force small so as to pose no threat to Iraq’s neighbors, and it would be built slowly to create a professional force under civilian control. Eaton would later call this Phase I of building the NIA. 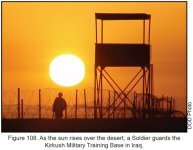 In July 2003 the US Government bolstered CMATT’s effort by sending a team of contractors from the Vinnell Corporation to Iraq. Composed of retired Army and Marine Corps personnel, the contractor team was supposed to begin planning and preparations to train the new army.39 The Vinnell contract provided planners, operations officers, unit trainers, and translators, but the US Government had not asked the company to provide drill instructors—the trainers who work directly with military recruits to instill fundamental skills and knowledge. Instead, CMATT assumed that US and Coalition forces would provide the Soldiers to serve as drill sergeants for the NIA’s basic training. CENTCOM, however, never tasked that mission to CJTF-7 and the drill sergeants did not materialize until much later. At this point CMATT faced a significant problem. While its staff had grown to 18, it was still far too small to provide drill sergeants from within its own organization.40 Assistance came from the Coalition partners. The British and Australian Army each provided four senior noncommissioned officers (NCOs) and officers to support the basic training mission. CMATT would also get seven US officers from the 3d Infantry Division (3d ID) for a 2-week period that summer. This mix of Americans, Britons, and Australians were the sum total of uniformed, military personnel available to CMATT in July 2003, and they worked tirelessly to find recruits and supplies so that training could begin.41 Major General Eaton credits them with saving the program from collapse. 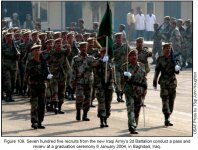 The enlisted soldiers of the first Iraqi battalion graduated from training at Kirkush on 4 October 2003, and the second battalion graduated from a rebuilt base in Taji, just north of Baghdad, on 6 January 2004, a date recognized as Iraqi Army Day. After graduation, some of the soldiers stayed at the academy to help teach while others began their careers in the NIA. By late January 2004 CMATT had trained the enlisted soldiers of the first three battalions of the NIA. The initial set of Iraqi battalions did not have the capability of mounting operations because they lacked a cadre of trained officers and NCOs. The creation of this corps of officers and NCOs was occurring separately from the training of the enlisted soldiers. CMATT had screened roughly 750 Iraqi officers, from lieutenant to general, and then sent them to Jordan for training in late December. Similarly, 750 NCOs were in training at the new NCO Academy in Taji.49 CMATT planned to form successive battalions of the NIA by taking officer–NCO cohorts from these two schools and linking them up with recruits after basic training. But funding delays at the DOD in the fall and winter of 2003/2004 prevented CMATT from meeting its plan. Eaton could not remain on schedule in the construction of more bases, and this delayed the start of basic training for the 7th Battalion of the NIA for a number of months. 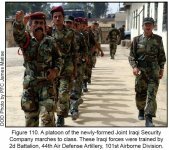 From the beginning of their mission, Eaton and others at CMATT recognized that the Iraqi forces would need continued training and mentoring if they were to accomplish their missions. Out of this realization came a plan to assign a 10-man advisory team to each battalion after it completed basic training. In mid-September the CMATT staff submitted a Joint Manning Document (JMD) request to the US Joint Staff for action. Because Secretary of Defense Donald Rumsfeld had ordered the acceleration of NIA training on 5 September 2003, the CMATT JMD requested a large number of advisory teams. The new plan, called Phase II, moved the deadline for the fielding of the first three divisions from September 2006 to September 2004. While DOD had accelerated the overall schedule, the US Army and Marine Corps still required 6 months to locate, train, and deploy the advisory teams. The first advisory teams were not sent to Iraq until March 2004; they joined their units 1 month later.50 Part of the challenge of getting advisors into the CMATT program was that in June 2003, the US Armed Services had just begun to fill CENTCOM’s demands for advisors to serve in Task Force (TF) Phoenix—the program to build a new Afghan Army. Planning for that effort had begun in the fall of 2002. The demands of Operation ENDURING FREEDOM (OEF) and OIF were putting significant strain on both the Army and the Marine Corps to sustain the ever-increasing need for personnel. *In September 2005, responsibility for advising the Ministries of Defense and Interior was turned over to the MNSTC-I.